During the breeding season, Black Terns form colonies in the wetlands. These birds build their floating nests with material from emergent plants. 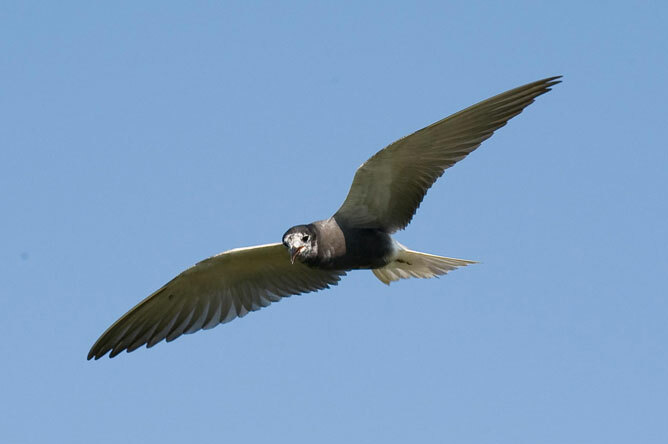 In 2005, Pierre Brousseau, a biologist at the Canadian Wildlife Service (part of Environment Canada) began to keep an inventory of Black Tern colonies along the St. Lawrence, from Lake Saint-Pierre to the Boucherville Islands. 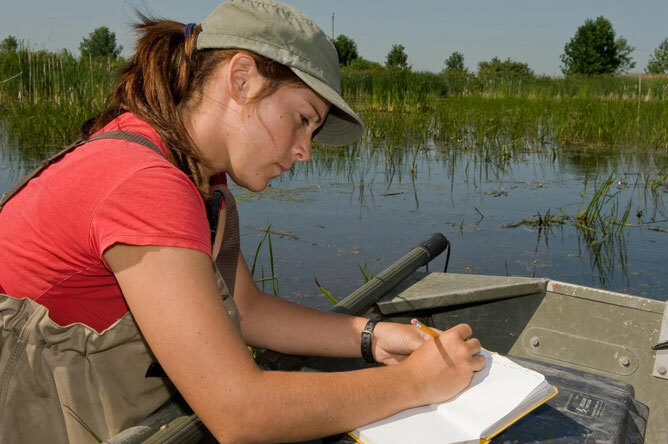 The data collected allows researchers to monitor population trends and assess the impact of changes in water levels on the reproductive success of Black Terns. 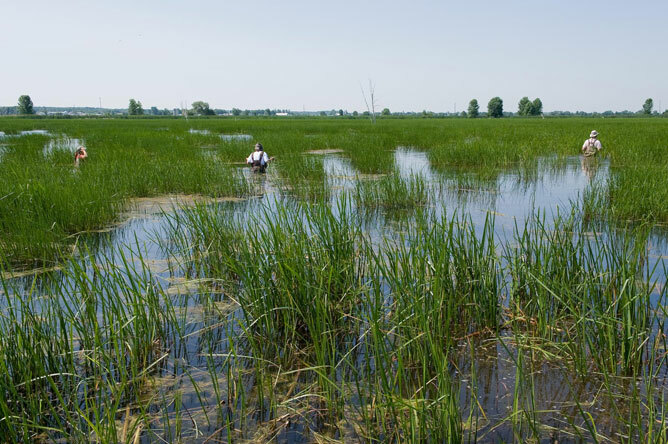 (left to right) Jenny Guillemette, Pierre Brousseau and Paul Messier look for nests in a marsh in Baie-du-Febvre. 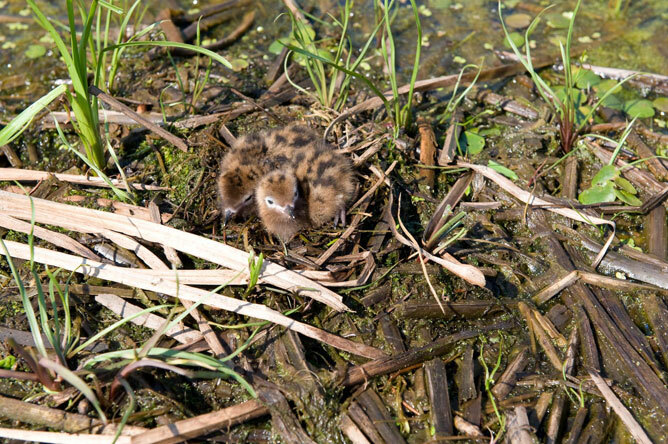 Three Black Tern chicks stay perfectly still in their floating nest, blending into their environment thanks to the colour of their down. When the parents are away, the chicks are highly vulnerable to predators and must try to remain unobserved. 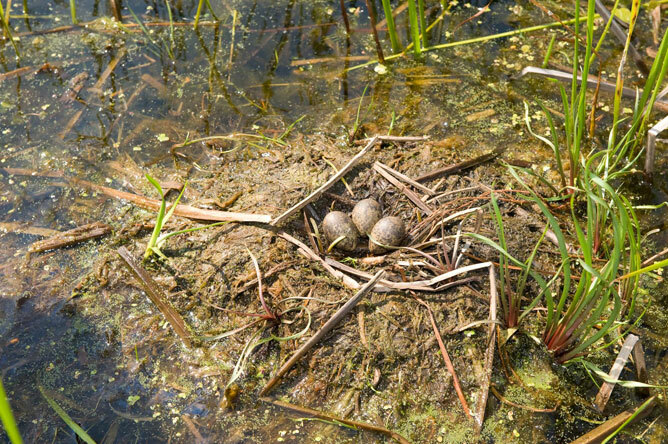 A nest usually contains two or three chicks. The Société d'aménagement de la baie Lavallière (SABL) offers technical assistance to a variety of research programs. Paul Messier, wildlife technician and director of the SABL, weighs each chick. He then places a band around the bird's leg. Each band has a unique serial number, enabling researchers to identify and track individual birds. 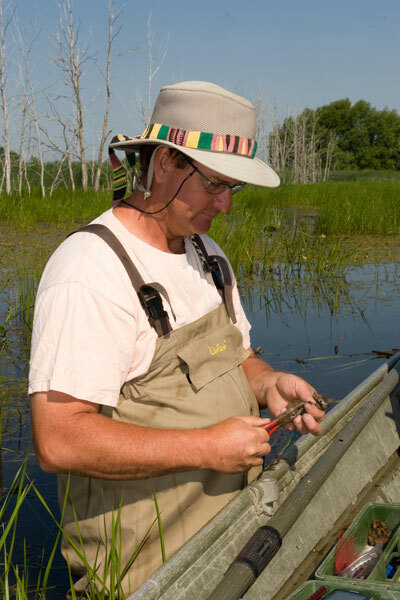 Banding is generally used to monitor bird populations. 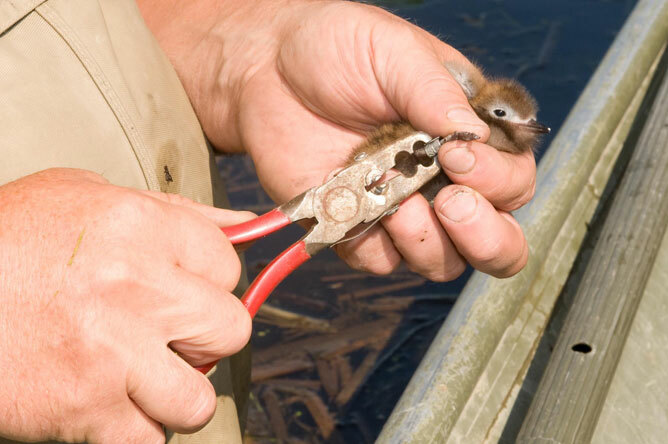 To band wild birds, researchers must obtain a permit from the Canadian Wildlife Service. It is important to use the right size of band for the targeted species. 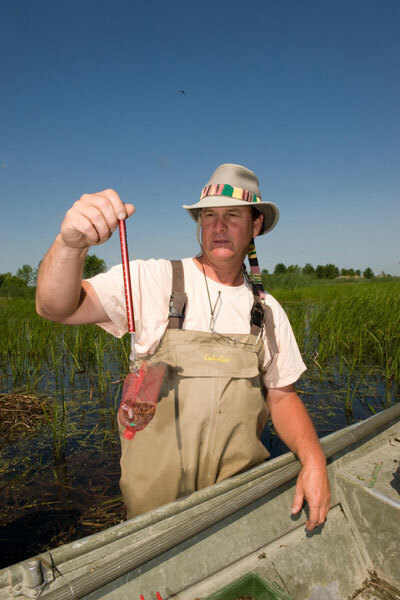 Birds should only be banded by an experienced biologist or wildlife technician. A pair of pliers is used to close the band properly so that it will not injure the bird's foot. Jenny Guillemette, an employee of the Société d'aménagement de la baie Lavallière (SABL), notes the various measurements taken for each banded bird. Just like the downy chicks, the eggs of the Black Tern are camouflaged by their colours and patterns. 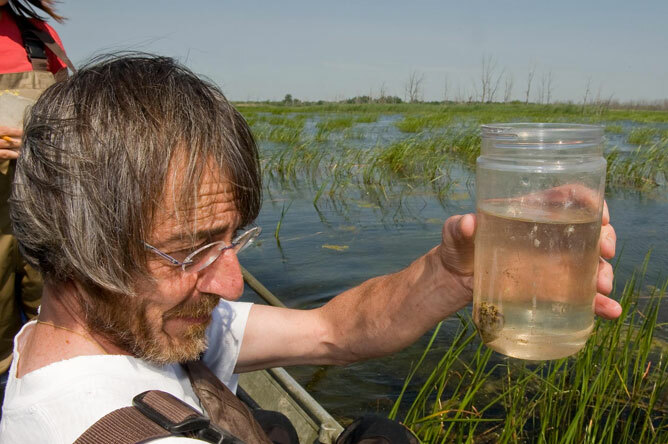 Biologist Pierre Brousseau checks the development of an egg by placing it in water. The more the egg sinks, the less developed the embryo is. Eggs contain an air pocket that expands as the embryo grows, making the egg float.